If you're lucky, you'll find a perfect fitting pair of jeans that last forever. Not many people have this luck. If you are like the rest of us unlucky people, you may find a pair here and there that fits nicely. However, rarely do your best fitting jeans last for a long time. I mean, if they fit good, you wear them a lot, and they eventually start to show signs of wear. Your favorite pair of jeans gets ripped or worn in certain spots, so you don't wear them, but you don't want to get rid of them either. It is frustrating, but what can you do? We have a ton of ideas for what to do with old jeans no matter what's wrong with them. You don't always have to say goodbye to those faithful old jeans that have gotten you through so much. Plus, it's just a good thing to find ways to get more use out of clothing. Cause, really, who wants to waste money? So, do something with your old jeans. When it comes to deciding what to do with old jeans, the first step is to identify what is wrong with them. Why aren't you wearing them? There are many different reasons, but in almost every case, there is a great solution. Consider the following possible issues you may have. Pro tip: Don't wash your jeans. Well, don't wash them too often at least. Manufacturers say they will last longer the less you wash them. One Note: If you buy new jeans and they don't fit, it may not be your fault. 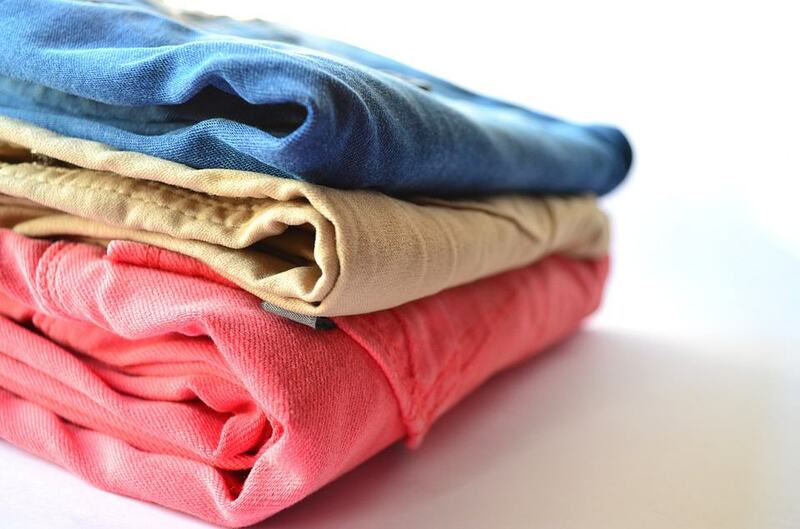 Studies have shown that there are serious inconsistencies with sizing for women's clothing. So, don't get hung up on the number. 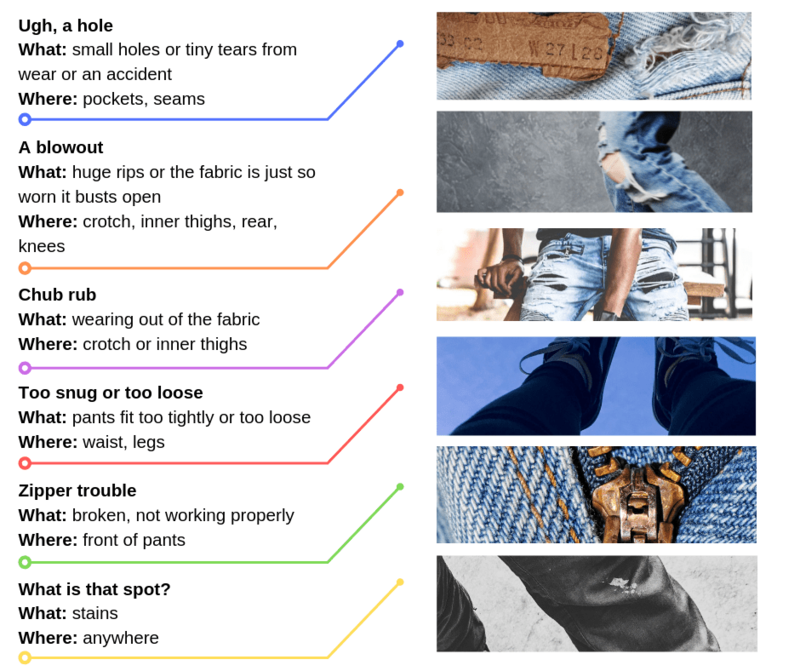 Pinpoint exactly is what wrong with your jeans. Now, keep reading because we have some creative and fun ideas to help you breathe some new life into your denim. Old jeans could mean many things. They could be the jeans you used to wear before you gained a little weight. They could be the jeans you've had since high school that have seen you through three relationships, two trips to Cancun, and a few too many late-nights as a new parent. Or maybe they're the jeans you paid way too much money for only to discover the quality is a bit lacking. We have so many great things for you to do with them. You might be able to fix them or alter them for a better fit. You might be able to transform them or recycle them. Someone else may benefit from them if you choose to donate. Discover your options and create something great with those jeans you thought couldn't be saved. A hole in your jeans does not and should not mean the end. You can take care of holes. Even if you can't even thread a needle, you can at least apply an iron-on patch. However, small holes near seams are best fixed by sewing. It's actually not that hard to do. You will do yourself a huge favor by learning basic sewing skills. Some holes are actually trendy, like rips in the knees. So, sometimes you can just leave them alone. But some holes are embarrassing. Nobody wants peep jeans that show off their underwear. If this is your problem, then apply a patch. Patches can be decorative, but they also can be practical. A practical patch job starts with trimming away the fraying around the hole. Denim is notorious for fraying along raw edges. Just cut that away to get a clean hole. Turn your jeans inside out, and place a matching fabric over the hole. Use some fusible, which is sticky stuff that adheres fabric to fabric when heated, and put it around the hole in your jeans. Lay the scrap fabric on top and go over it with a hot iron. Now, to ensure this patch stays in place, you should sew around it with a sewing machine, which makes much strong stitching than hand sewing. Turn your jeans right side out and sew. Make sure to go around it a few times. Add in a zig-zag stitch for even more strength. This already tore once, so it's an area under stress. You want to make sure your patch stays. That's it. You've patched things up. ou can also add decorative patches or use different fabrics to patch holes if you don't mind them standing out a bit. Y The process is the exact same as above unless you use an iron-on patch, which you lay over the hole on the outside of the jeans and iron into place. Who hasn't had a zipper that didn't want to cooperate? I'm waiting. I'm pretty sure we've all had zipper issues at one point. It's just the nature of these metal teethy things. Don't get me wrong -- the zipper is an amazing invention, but one with some faults. Zippers break. They fall apart. They get stuck. They won't stay up. I think you get the idea. If you struggle with a zipper issue, it's not the end of your jeans. Fix it with a keychain! Yep, just hook the keychain in the zipper pull. Pull the zipper up. Hook the keychain ring around your pants button and button your jeans. That zipper isn't going anywhere. Some zippers loose teeth like a first grader. If you have this problem and the teeth missing are at the bottom, then you can add a zipper stopper or just sewing a thick line right before the missing teeth. If this leaves a gap, sew that up, too. Your zipper will be shorter, but it will close properly again. The worst case scenario is you will have to replace the zipper. Don't freak out on me. This can be a little complicated, but you can do it if you have a sewing machine. New zipper complete. That wasn't so bad. Let's face it. Most of us will gain a little weight from time to time. Some of us will even lose a little weight. Some jeans may fit right, but they may be a touch too long or a smidgen too short. This leads to jeans that just don't fit right anymore. Whether your trouble is a waist that's too tight, a rear that's too loose, pants that drag the floor, or a look that makes people think you have water wading plans in the near future, we've got a solution for you. Save your jeans, man! Learn the art of alteration. Making jeans bigger is more difficult than making them smaller. The simple fact is to make something bigger, you have to add to it. This could result in an eyesore. So, just be aware of the risks before you start cutting. Cut at each side seam. Cut at the back, middle seam. It kind of depends on how much bigger you need to make them as to which option to use. If you need to just go up a couple of inches, then cut at the back, middle seam. If you need to go up any more than that, use the side seam method. Both methods are basically the same in theory. For the side seam cuts, you want to make your cuts at each side seam on the waistband. Pull them apart, so they look like an inverted triangle. Or a slice of pizza! Now, get some scrap denim or fabric and sew it into the triangles. Do note that side seam additions are noticeable. You will probably want to wear your jeans with a long top after altering. At least the jeans won't cut off your circulation anymore when you sit down. So, that's a plus. The back, middle seam method does require a little more work, but it can be done, so the alteration is hidden. You want to first remove the back belt loop by undoing the stitching at the top. Leave the bottom stitched. Cut down the back seam to where the belt loop is still secured. Add in a piece of fabric to create the inverted triangle. Finish by sewing the belt loop back in place. Now, this may not show as much, but it also won't give you a lot of extra room in the waist, so keep that in mind. If your jeans are too big, you can make them smaller with a little sewing and cutting. This is easier and less noticeable than letting them out. However, the process is similar. Again, there are a couple of methods. You can add darts or reduce the back seam. As before, it depends on how much you need to take them in. If you have a gaping waistband, then do the darts. If the jeans are all over too big, reduce the back seam. Cut the excess fabric and remove the pins. You've done it! Now they will fit like a dream. If you've got bigger problems and your jeans are just way too loose in the waist, hips, and rear, then you need to take more dramatic steps to alter them. You want to fold your pants in along the back seam. Pin it. Now turn your jeans inside out and mark the fold with chalk. Refold, so the excess folded fabric is on the inside and re-pin. Sew it up, and don't forget to reinforce your stitches, so your new seam doesn't break apart. Remove the pins, and cut the excess fabric. Tightening the waistband using darts starts with folding your jeans in the back in two spots right above the back pockets. Fold them in a little to form inverted triangles and pin them. Pro tip: Do your alteration pinning while you have the jeans on to ensure the perfect fit. Turn them inside out and mark with chalk. Remove the pins and re-pin on the inside, creating the same dart. Sew along your chalk marks. Make sure to sew a few times for strength. Perhaps you also want to alter the fit of the legs. You can make your jeans skinnier by taking in the seam of the inside legs. A Word of Advice: Men be careful about making your jeans too skinny. Medical experts say too tight jeans can lead to bladder, testicle, and urinary tract issues. Scary! You will open the inner leg seam and fold it as needed to get the fit you want. Resew the seam closed. If you want to make the leg fit bigger, you will have to add in fabric. This is best done along the outside hem. Remove the seam stitches up to the point where you want the jeans to become looser. Add in fabric between the seams to get the desired fit. This is where you can get creative and give your jeans a new look. You can add contrasting fabric or even lace. Get into a designer mindset and create a look. Jeans that are too long were actually quite fashionable in the 1990s. Everyone had frayed hems that were mud-stained, and we all thought we were cool. Today, the look isn't quite so coveted. People these days like their jean hems without the mud stains, please. If your jeans drag the ground, you have a couple of options. First, you can hem them up by cutting off the excess length, turning the raw edge under and sewing a hem. You can add a stylish cuff. Come on. Everyone is doing cuffed jeans. They look so cute. Or cool in that James Dean, 1950s way, depending on how you cuff them. You just fold them up however you want. You can leave the hem up or roll the jeans a couple of times to hide it. Then just tack the hem in place with a few stitches at each side seam. Not into the cropped look? Are your jeans too short, and it's driving you crazy because you hate cold ankles? Well, have I got a solution for you. Just add some extra fabric to the bottom of your jeans. For a smooth look, remove the hem first and sew on the new fabric. Find your new jeans look. And keep those ankles covered! You might even start a trend. Maybe you can't alter your jeans, or the problems are a little too complex for your limited skills. Don't worry. You can still wear your jeans, it will just take some scissor handiwork. If you are battling excessive holes in the legs or jeans that are just too short to work, then consider cutting them off into shorts. You can cut the legs off at whatever length works for you. Hem the edges or leave them raw. Just make sure to cut the legs even, or you will end up in that battle where you cut one shorter and then go too short, so you have to cut the other until you have cut too much off. Then you'll end up with some Daisy Dukes. If fit is the issue and your jeans are too small or big, a better option for you may be turning them into a skirt. It lets you adjust sizing a bit. Start by removing the seams along the inner legs and up to the bottom of the zipper in the front and the bottom of the pockets in the back. Now cut it off to the desired length. You can also leave it as is for a longer skirt. Fold the front and back areas, so they lay flat. You want to sew these sections. If you have a gap left between the old legs, you can add in fabric or denim to complete the skirt bottom. Finish with hemming, or you can leave the bottom raw for a frayed look. Are stains your issue? Have your jeans seen better days and faded into a nasty look? If these are your issues, then let's talk about making them look amazing again. You can change the whole overall color using a dye. Or try tye dying with either dye or diluted bleach for a retro look. Another option is to update your jeans with a pattern or other design using bleach or permanent markers. You will do both the same way. Make sure as you work, you put a piece of aluminum foil underneath the area you are working on to prevent bleed through. Use a bleach pen or permanent marker to draw whatever you want. You can also embellish them by using jewels, beads, lace, or sequins. Tack some embellishments along the side seams and pockets. Add pom poms or lace to create a whole new look. Or paint your jeans with fabric paint to design your own masterpiece. Become a jean designing machine. Remember before when we said don't throw your old jeans out no matter what? Sometimes, you have to accept that your jeans are not wearable anymore. If you have a huge rip in the crotch or rear, patching or paint probably won't fix your problem. This is a good time to consider repurposing them into a whole new item. Your jeans get a second life, and you don't contribute to the growing landfills. It's a win-win. Keep weaving until it is as big as you want the bottom of your basket. Using a bucket or basket as a guide, place your weaved portion on the bucket or basket bottom, so the loose strips hang down the sides. Resume weaving until your new basket is at the right height. The guide will ensure it gets the basket look. Cut or tuck in any loose ends, and you have a cut new basket. Lay eight strips down meeting in the middle (like an asterisk), and tie them together at the middle point. This is your base. Tie the other strips together end to end to create one long strip. Using your other strips, begin to weave -- taking the fabric over and under the strips in the base. Old jeans make great baskets. To make a basket, cut your jeans into strips around one inch wide. You will need about 20 strips. Denim is a rugged material. When reusing it, it is ideal for rugs that will last almost forever. If you are using your jeans for different projects, you will probably have all the waistbands and seams left over. Stitch them together into a rectangle. Trim the sides. Add a border using more waistbands or side seams. Just remember to remove the buttons, snaps, and other metal. Nobody wants to step on those. That would probably be worse than stepping on a Lego, and we all know the horror of that. Use the remaining jean material to create the main part of the placemat. Avoid using the seams since they will cause the placemat to be uneven. You may have to sew two or more piece together to get the right size. Just press the seams with an iron so they lay flat. Hem the edges so they are smooth and neat. Attach the pocket. And you're done! And you can also create simple pillows. You just need to cut out two pieces of denim that are the same size and shape. You can also piece together smaller fabric pieces for a patchwork look. Jean is a classic fabric. Why not use old jeans to make home décor? Right? I know! That is a crazy idea. But it really does result in some beautiful creations. Try making placemats. The back pocket becomes a holder for the napkin and silverware. Please add a picture of placemats made from jeans, if possible. Start by removing the pockets from your jeans. You can really do whatever size, shape, or design you want. Sew the piece together with the right sides (that is the side you want to be the outside of the pillow) together. Sew almost completely around the pieces, leaving just a small unsewn area. Pull the fabric through that small opening to turn the fabric right side out. You have a chic pillow to add a touch of jean style to your home. Let's face it. Not all of us are the crafty type. If you fall into this category, then you know it's probably best that you don't try repairing, repurposing, or redesigning your old jeans. You've tried and tried, but it's just not happening. We still don't want you to toss your jeans. There's still hope. One option is to look for a jean recycling program. Blue Jeans Go Green program is a good one. This program turns old jeans into insulation. Yes! Insulation, like for buildings. You give them your old jeans, and they create a very useful product. What a way to make some extra cash and make good use of old jeans! See! Everyone has better options than a trash can. Talking about all the amazing things you can do with your old jeans has actually been fun. There are so many options and projects. You really should never just toss jeans into the garbage. The material is strong and reusable in various ways. So, go green! Find a way to give your old jeans a new life. Your jeans are waiting. What are you going to do with your old jeans? Tell us all about it in the comments!